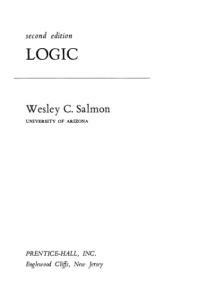 Logic: A Very Short introduction 'a delightful and engaging introduction to the basic concepts of logic. in history, philosophy, religion, science, and the humanities. Over the next few years it will grow to a library of around 200 volumes - a Very Short Introduction to everything from ancient Egypt and Indian philosophy to conceptual art and cosmology. 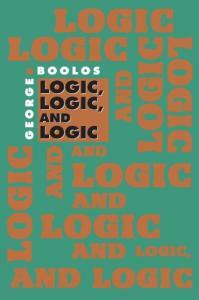 This book is dedicated to all those who have ever thought about logic - or who ever will. Validity: What Follows from What? true that you will need the determination to master some symbolism that may be new to you; but this is a lot less than is required to have a basic grasp of any new language. And the perspicuity that the symbolism gives to difficult questions makes any trouble one may have in mastering it well worth it. One warning, though: reading a book on logic or philosophy is not like reading a novel. There will be times when you will have to read slowly and carefully. Sometimes you may have to stop and think about things; and you should be prepared to go back and reread a paragraph if necessary. 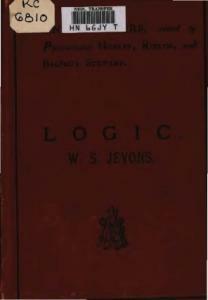 The final chapter of the book is on the development of logic. 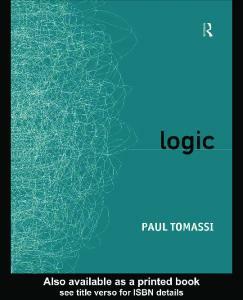 In this, I have tried to put some of the issues that the book deals with in an historical perspective, to show that logic is a living subject, which has always evolved, and which will continue to do so. The chapter also contains suggestions for further reading. There are two appendices. The first contains a glossary of terms and symbols. You may consult this if you forget the meaning of a word or symbol. The second appendix contains a question relevant to each chapter, with which you can test your understanding of i t s main ideas. The book goes for breadth rather than depth. It would be easy to write a book on the topic of every single chapter - indeed, many such books have been written. And even so, there are very many important issues in logic that I have not even touched on here. But if you hang in there till the end of the book, you will have a pretty good idea of the fundamentals of modern logic, and why people find it worth thinking about the subject. Rome is the capital of Italy, and this plane lands in Rome; so the plane lands in Italy. Moscow is the capital of the USA; so you can't go to Moscow without going to the USA. premisses. Logicians call an inference where the conclusion really does follow from the premisses valid. 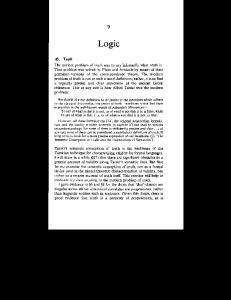 So the central aim of logic is to understand validity. You might think this a rather dull task - an intellectual exercise with somewhat less appeal than solving crossword puzzles. But it turns out that this is not only a very hard matter; it is one that cannot be divorced from a number of important (and sometimes profound) philosophical questions. We will see some of these as we go along. For the moment, let us get a few more of the basic facts about validity straight. To start with, it is common to distinguish between two different kinds of validity. To understand this, consider the following three inferences: I.
would be footprints outside; but there are no footprints; so the burglar didn't break in through the kitchen window. 2. Jones has nicotine-stained fingers; so Jones is a smoker. do this because the infinite collections are encapsulated in a finite set of rules that are hard-wired into us; that evolution has programmed us with an innate grammar. Could logic be the same? Are the rules of logic hard-wired into us in the same way? Main Ideas of the Chapter A valid inference is one where the conclusion follows from the premiss(es). Truth F U D Ca*L Z Q ~ SOF N a t ? Either the Queen is rich or pigs can fly. Pigs can fly. The first of these seems valid. Consider i t s conclusion. Logicians call sentences like this a disjunction; and the clauses on either side of the 'or' are called disjuncts. Now, what does it take for a disjunction to be true? Justthat one or other of the disjuncts is true. So in any situation where the premiss is true, so is the conclusion. The second inference also seems valid. If one or other of two claims is true and one of these isn't, the other must be. Now, the trouble is that by putting these two apparently valid inferences together, we get the apparently invalid inference, like this: The Queen is rich. Either the Queen is rich or pigs can fly. Pigs can fly. has the value T just if a has the value F.
has the value Fjust if a has the value T.
If a has the truth value given in the column under it, ~a has the corresponding value to its right. What of disjunction, V? As I have already noted, a natural assumption is that a disjunction, a V b, is true if one or other (or maybe both) of a and b are true, and false otherwise. We can record this in the truth conditions for disjunction: a V b has the value Tjust if a t least one of a and b has the value T. a V b has the value F just if both of a and b have the value F.
What about the inference qVp, lq/p? What about the inference with which we started: 9, +/p? Here, then, is a solution to the problem with which we started. According to this account, our original intuitions about this inference were wrong. After all, people's intuitions can often be misleading. It seems obvious to everyone that the earth is motionless - until they take a course in physics, and find out that it is really hurtling through space. completely determined by the truth value of the sentence a. In a similar 2 way, the truth values of the sentences aV b and a & b are completely determined by the truth values of a and 6. Logicians call operations that work like this truth functions. But there are good reasons to suppose that 'or' and 'and', as they occur in English, are not truth functions - a t least, not always. For example, according to the truth table for & , 'a and b' always has the same truth value as 'b and a': namely, they are both true if a and b are both true, and false otherwise. But consider the sentences: I.
Johnhit his head and fell down. Johnfell down and hit his head. Main Ideas of the Chapter In a situation, a unique truth value (Tor F) is assigned t o each relevant sentence. -a is T just if a is f. a V b is T just if at least one of a and b is T. a & b is Tjust if both of a and b are T.
Chapter 3 Names and Quantifiers: 1s Nothing Something? The inferences that we looked a t in the last chapter involved phrases like 'or' and 'it is not the case that', words that add to, or join, whole sentences to make other whole sentences: but there are lots of inferences that appear to work in a quite different way. Consider, for example, the inference: Marcus gave me a book. Someone gave me a book. Neither the premiss nor the conclusion has a part which is itself a whole sentence. If this inference is valid, it is so because of what is going on within whole sentences. Traditional grammar tells us that the simplest whole sentences are composed of a subject and a predicate. Thus, consider the examples: 1. 4. Nobody came to my party. said about it. Now, when is such a sentence true? Take the second example. It is true if the object referred to by the subject 'Annika* has the property expressed by the predicate, that is, fell asleep. All well and good. But what does the subject of sentence 3 refer to? The person who hit me? But maybe nobody hit me. No one said that this was a trde sentence. The case with sentence 4 is even worse. To whom does 'nobody' refer? In Through the Looking Class, just before her encounter with the Lion and the Unicorn, Alice comes across the White King, who is waiting for a messenger. (For some reason, when the messenger turns up, it looks disconcertingly like a rabbit.) When the King meets Alice, he says: 'Justlook along the road, and tell me if you can see. to one of these objects. And if we write H for 'is happy', then the sentence mH is true in the situation just if the object referred to by m has the property expressed by H. (For perverse reasons of their own, logicians usually reverse the order, and write Hm, instead of mH. This is just a matter of convention.) Now consider the sentence 'Someone is happy'. This is true in the situation just if there is some object or other, in the collection of objects, that is happy - that is, some object in the collection, call it x, is such that x is happy. Let us write 'Some object, x, is such that' as 3x. Then we may write the sentence as: '3x x is happy'; or remembering that we are writing 'is happy' as H, as: 3x xH. Logicians sometimes call 3x a particular quantifier. relevant domain that was seen by her. everything that happens has some cause or other - that is, for every x, there is a y, such that x is caused by y; or it can mean that there is something which is the cause of everything - that is, there is some y such that for every x, x is caused by y. Suppose we think of the relevant domain of objects as causes and effects, and write 'x is caused by y' as xCy. Then we can write these two meanings as, respectively: 1.
came into existence. In the first case, it had no beginning, but was always there; in the second, it began a t some particular time. At different times, physics has, in fact, told us different things about the truth of this matter. Never mind this, however; just consider the second possibility. In this case, the cosmos came into existence out of nothing or nothing physical, anyway, the cosmos being the totality of everything physical. Now consider that sentence, 'The cosmos came into existence out of nothing'. Let c be the cosmos, and let us write 'x came into existence out of y' as xEy. Then given our understanding of quantifiers, this sentence should mean J x cEx. But it does not mean this; for this is equally true in the first alternative cosmology. In this, the cosmos, being infinite in time past, did not come into being a t all. In particular, then, it is not the case that it came into being from something or other. When we say that in the second cosmology the cosmos came into existence out of nothing, we mean that it came into being from nothingness. So nothing can be a thing. The White King was not so foolish after all. Main Ideas of the Chapter The sentence nP is true in a situation if the object referred to by n has the property expressed by P in that situation. 3x xP is true in a situation just if some object in the situation, x, is such that xP. Vx xP is true in a situation just if every object in the situation, x, is such that xP. all seem banal and obvious, but things are not as simple as they appear. Because descriptions carry information in this way, they are often central to important arguments in mathematics and philosophy; and one way to appreciate some of these complexities is to look a t an example of such an argument. This is another argument for the existence of Cod, often called the OntologicalArgument. The argument comes in a number of versions, but here is a simple form of it: Cod is the being with all the perfections. But existence is a perfection. 50 Cod possesses existence. Main idea of the Chapter ~ x c pis true in a situation just if, in that situation, there is a unique object, a, satisfying c, and UP. Chapter 5 Self-Reference: What is this Chapter About? part. For example, consider the sentence 'This sentence contains five words'. The name which is the subject of this sentence, 'this sentence*, refers to the whole sentence, of which that name is a part. Similar things happen in a set of regulations which contain the clause 'These regulations may be revised by a majority decision of the Department of Philosophy', or by a person who thinks 'If I am thinking this thought, then I must be conscious'. These are all relatively unproblematic cases of self-reference. There are other cases which are quite different. For example, suppose someone says: This very sentence that I am now uttering is false. claims, it is true. In either case, A would seem to be both true and false. The sentence is like a Mobius strip, a topological configuration where, because of a twist, the inside is the outside, and the outside is the inside: truth is falsity, and falsity is truth. Or suppose someone says: This very sentence that I am now uttering is true. Is that true or false? Well, if it is true, it is true. since that is what it says. ~a has the value Tjust if a has the value F. -la has the value Fjust if a has the value T. a & b has the value T just if both a and b have the value T.
a contentious one, ever since Eubulides. It is, indeed, a very tangled issue. Main ldea of the Chapter Sentences may be true, false, both, or neither. @[email protected] Possibi%ity: What bWi I be blust be? functions. As we saw in Chapter 2, when you know the truth value of a, you can work out the truth value of a ,. not follow from 1 a t all. P+~P* Now consider some statement about the future. Again, for example, let it be the claim that Iwill be involved in a traffic accident tomorrow. that I gave. So is fatalism true after all? Main Ideas of the Chapter Each situation comes with a collection of assodated possible situations. Oa is true in a situation, s, if a is true in every situation associated with s. Oa is true in a situation, s, if a is true in some situation associated with s.
In this chapter we'll turn to the logical operator that I introduced in passing in the last chapter, the conditional. Recall that a conditional is a sentence of the form 'if a then c', which we are writing as a + c. Logicians call a the antecedent of the conditional, and c the consequent. We also noted that one of the most fundamental inferences concerning the conditional is modus ponens: a, a + c/c. Conditionals are fundamental to much of our reasoning. The previous chapter showed just one example of this. Yet they are deeply puzzling. They have been studied in logic ever since its earliest times. In fact, it was reported by one ancient commentator (Callimachus) that a t one time even the crows on the rooftops were cawing about conditionals. Let us see why - or, a t least, one reason why - conditionals are puzzling. & -c) is often written as a 2 c, and called the material conditional. that you will go and not spend money: -,@ & lm). manual was a computer manual, and people are normally relevant in what they say. Hence, I can conclude that it is a computer manual from the fact that they said what they did. The inference is not a deductive one. After all, the person could have said this, and it not be a computer manual. But the inference is still an excellent inductive inference. It is of a kind usually called conversational implicature. To see that this comes out valid, suppose the premisses are true in some situation, s. Then 6 is true in every possible situation associated with s where a is true; and likewise, c is true in every associated situation where b is. So c is true in every such situation where a is true. That is, a + c is true in s.
Smith will retire and take her pension. Hence, if Smith dies before the election, she will retire and take her pension. This is exactly an inference of the form 1. But it seems clear that there could be a situation in which both premisses are true. But not the conclusion - unless we are considering a bizarre situation in which the government can effect pension payments in the after-life! Or consider the following inference concerning said Smith: If Smith jumps from the top of tall precipice, she will die from the fall. Hence, if Smith jumps from the top of a tall precipice and wears a parachute, she will die from the fall. about most things, they are still one of the most contentious areas of logic. If birds are no longer crowing about conditionals, logicians certainly are. Main Idea of the Chapter a + 6 is true in a situation, s, just if 6 is true in every situation associated with s where a is true. The Future and t h e Past: s Time Real? Time is something that we are all very familiar with. We plan to do things in the future; we remember things in the past; and sometimes we enjoy just being in the present. And part of our finding our way around in time is making inferences that concern time. For example, the two following inferences are intuitively valid: It is raining. It will have been raining. It will be true that it has always been raining. It is raining. and later situations. Fa is true in a situation if a is true in some later situation. Pa is true in a situation if a is true in some earlier situation. Ca is true in a situation if a is true in every later situation. properties, and we do not have a violation of Leibniz's Law. snake shedding its skin.) Now, the identity of something can't be affected by whether there are other things around. So A is B. Likewise, A is C.
properties. So B is not really A. Likewise C. But now we are back with the problem with which we started the chapter. While we are on the subject of identity, here is another problem about it. Everything wears out in time. Sometimes, parts get replaced. Motor bikes and cars get new clutches; houses get new roofs; and even the individual cells in people's bodies are replaced over time. Changes like this do not affect the identity of the object in question. When I replace the clutch on my bike, it remains the same bike. Now suppose that over a period of a few years, I replace every part of the bike, Black Thunder. now stands next to it in the garage. Here is another example of the same problem. A person who is 5 years old is a (biological) child. If someone is a child, they are still a child one second later. In which case, they are still a child one second after that, and one second after that, and one second after that,. (biological) adult seems to fade in gradually. It seems natural to suppose that the truth value of 'Jack is a child' also fades from true to false. Truth, then, comes by degrees. Suppose we measure these degrees by numbers between 1 and o, 1 being complete truth, o complete falsity. Every situation, then, assigns each basic sentence such a number. Here is a table of some sample values. Values of a are down the left hand column; values of b are along the top row. The corresponding values of a & b are where the appropriate row and column meet, For example, if we want to find I a & b I , where I a I = 0.25 and I b I = 0.5, we see where the italicized row and column meet. The result is in boldface. terribly obvious. Here is one (fairly standard) suggestion, which a t least seems to give the right sorts of results.
. . . it does. That's one diagnosis of the problem. But with vagueness, nothing is straightforward. What was the problem about saying that 'jack is a child' is simply true, until a particular point in time, when it becomes simply false? just that there seems to be no such point. Any place one chooses to draw the line is completely arbitrary; it can be, a t best, a matter of convention. But now, a t what point in jack's growing up does he cease to be loo%a child; that is, a t what point does 'jack is a child' change from having the value of exactly I, to a value below 17 Any place one chooses to draw this line would seem to be just as arbitrary as before. (This is sometimes called the problem of higher-order vagueness.) If that is right, we haven't really solved the most fundamental problem about vagueness: we have just relocated it. A sentence is true In a situation just if its truth value is at least as great as the (contextually determined) level of acceptability. Despite the fact that Holmes is wont to call this kind of inference a deduction, the inference is, in fact, an inductive one. It is entirely possible that Wilson's coat should have shown these patterns without his having done much writing. He could, for example, have stolen it from someone who had. None the less, the inference is clearly a pretty good one. What makes it, and inferences like it, good? One plausible answer is in terms of probability. So let's talk about this, and then we can return to the question. the probability of a. Conventionally, we measure probabilities on a scale between o and I. If pr(a) = o, a is certainly false; then as pr(a) increases, it gets more likely that a is true; until when pr(a) =I, a is certainly true. ability of the conclusion given the (conjunction of the) premiss(es) is greater than that of its negation given the premisses. Chapter 12 ndiHerent About it! Similarly: pr(bIa) = pr(b & a)/pr(a) so: 4- pr(b la) x pr(a) = pr(b & a). these two times. The mid-point between these times is 4.30 p.m. So by the Principle of Indifference, the car is as likely to arrive before 4-30p.m. as after it. But now, half way between sokm/h and iookm/h is 75km/h. I'll leave you to think about this. We have had quite enough about probability for one chapter! between them, they all have the same probability (Principle of Indifference). raining can be pretty miserable, so we would value that at, say, -5.
random, say by tossing a coin.) In the previous case, there are only two possibilities. In general, there might be more (say, going for a ride, going to the movies, and staying a t home). The principle is the same, though: I calculate the expectation of each possibility, and choose whichever has the greatest expectation. This sort of reasoning is a simple example from the branch of logic called decision theory. Now let's come back to Pascal's Wager. In this case, there are two possible actions: believing or not; and there are two relevant possibilities: Cod exists or does not. We can represent the relevant information in the form of the following table. God exists, and you don't believe, you are in trouble; but if Allah exists and you don't believe, you are equally in trouble; and so on. Moreover, if God exists, and you believe in Allah - or vice versa - this is even worse. For in both Christianity and Islam, believing in false gods is worse than being a simple non-believer. Let's draw up a table with some more realistic information. result is that you never toss the coin a t all, so you stay in Hell for ever! only rational thing to do is to be irrational! state all the possible outcomes that might result from a being true. The rational action is the one which makes true the statement with the greatest expectation. Aristotle lived in Athens much of his life, founded a school of philosophy called the Lyceum, and is usually reckoned to be the founder of logic. But a t about the same time, there was another flourishing school of logic in Megara, about 5okm west of Athens. Less is known about the Megarian logicians, but they seem to have been particularly interested in conditionals, and also in logical paradoxes. Eubulides (whom we met in Chapters 5 and lo) was a Megarian. Another important philosophical movement started in Athens around 300 BCE. It was called Stoicism, after the porch (Creek, 'stoa') where early meetings were held. Though the philosophical concerns of Stoicism were much wider than logic, logic was an important one of them. It is generally supposed that Megarian logic exerted an influence on the Stoic logicians. At any rate, a major concern of Stoic logicians was the investigation of the behaviour of negation, conjunction, disjunction, and the conditional. what was required, and triggered the start of the third, and possibly the greatest, of the three periods. Radically new logical ideas were developed by thinkers such as Frege (1848-1925) and Russell (18721970), whom we met in Chapters 2 and 4, respectively. 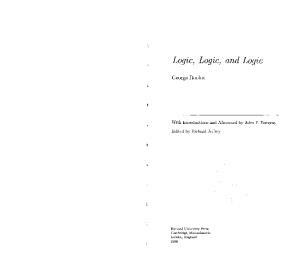 The logical theories developing from this work are normally referred to as modern logic, as opposed to the traditional logic that preceded it. Developments in logic continued apace throughout the 20th century, and show no sign of slowing down yet. 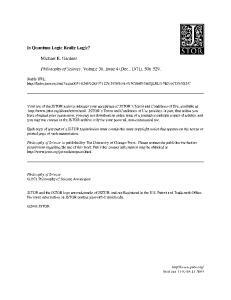 A standard history of logic is Kneale and Kneale (1975). This is a little dated now, and is characterized by more optimism than is perhaps justified, in its attitude that early modern logicians had finally got everything pretty much right; but it is still an excellent reference work. functional in the modern sense.) In its fully articulated form, it appears in the founders of modern logic, Frege and Russell. A modern dissident is Strawson (1952, ch. 3). modern logic text. Hodges (1977) is one that is not pitched a t too formidable a level; neither is Lemmon (1971). no sympathy with the symmetric idea that some sentences might be both true and false. That there might be such sentences, and that paradoxical sentences might be amongst them, is an unorthodox view that has been advanced by some logicians in the last 40 years. Discussions of the paradoxes of self-reference tend to get very technical very fast. Good introductory discussions can be found in Read (1994, ch. 6) and Sainsbury (1995, chs. 5, 6). The whole area remains highly contentious. 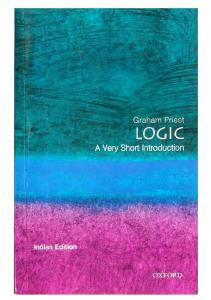 you are unlikely to get much out of this before you have mastered an introductory logic book of a more standard kind. Aristotle's argument for fatalism comes from De Interpretatione, ch. 9. He thought it fallacious, though not for the reasons given in this chapter. A reasonably accessible discussion of it can be found in Haack (1974, ch. 3). The argument with which the chapter finishes is a version of the 'Master Argument' put forward by the Megarian logician Diodorus Cronus. conditional). The nature of conditionals remains highly contentious. Read (1994, ch. 3) is a readable introduction, as is Part? of Sanford (1989). Chapter 8. Temporal reasoning is discussed by a number of medieval logicians. The approach described in this chapter was invented largely by the New Zealand logician Arthur Prior in the 1g6os, inspired by developments in modal logic. A readable account of the subject can be found in Bhrstrcam and Hasle (1995). McTaggart's argument appeared originally in 1908, though his presentation is somewhat different from mine. My presentation follows Mellor (1981, ch. 7). be found in Frege and Russell. There are presentations in most standard g P modern logic texts, such as Hodges ( i g n ) and Lemmon (1971). Puzzles about identity are legion in philosophy. The one with which the chapter ends is due, as far as I know, to Prior. ch. 7) and Sainsbury (1995, ch. 2). A much lengthier introduction is Williamson (1994). Chapter 1.1.Historically, inductive validity is quite under-developed, compared with deductive validity. Probability theory was developed in the 18th century, in connection with games of chance, largely by Frenchspeaking mathematicians, such as Pierre de Laplace and members of the prodigious Bernoulli family. The idea of applying it to inductive inference is due mainly to the German logician Rudolph Carnap in the 1950s. There are many notions of probability. The one described in this chapter is usually called the frequency interpretation. A good introduction to the whole area is Skyrms (1975). of Indifference also go back to the origins of probability theory. A standard introduction to reasoning of this kind is Howson and Urbach (1989); but this is not a book for those with a fear of mathematics. sophisticated than the argument of Chapter 3, and does not suffer from the problem pointed out there.) The Ontological Argument for the existence of Cod was proposed by the medieval philosopher Anselm of Canterbury. The version given in Chapter 4 is essentially due to the 17thcentury philosopher Rene Descartes in his Fifth Meditation. Biological versions of the Argument to Design were popular in the 19th century, but were destroyed by the Theory of Evolution. Cosmological versions, of the kind given in Chapter 12, became very popular in the 20th century. A good little reference work on arguments for the existence of Cod is Hick (1964). There is, of course, much more to the history of logic than the above details tell. Likewise, there is much to logic itself that is entirely absent from this book. We have been skating over the surface of logic. It has great depths and beauty that one could not even begin to convey in a book of this kind. But many of the great logicians of the past became engaged with the subject because of exactly the sorts of considerations and problems that this book discusses. If they have engaged you too, I can ask no more. The following glossary contains the terms of art and logical symbols that are employed in this book. The entries are not meant to be precise definitions, but are meant to convey the main idea for quick reference. By and large, the terms and symbols are reasonably standard, though there are several other sets of symbols that are also in common use. antecedent: what follows the 'if' in a conditional. conclusion: the part of an inference for which reasons are given. conditional: i f .
. .then . . .
disjuncts: the two sentences involved in a disjunction. expectation: the result of taking each possible outcome, multiplying i t s value by its probability, and adding all the results together. fuzzy logic: a kind of logic in which sentences take truth values that may be any number between o and 1. inductive validity: an inference is inductively valid when the premisses provide some reasonable ground for the conclusion, though not necessarily a conclusive one. inference: a piece of reasoning, where premisses are given as reasons for a conclusion.
. . . is the same object as . . .
property of the other. liar paradox: 'This sentence is false'. material conditional: not both (. . . and not . . .). modal operator: a phrase attaching to a sentence, to form another sentence expressing the way in which the first sentence is true or false (possibly, necessarily, etc.). modern logic: the logical theories and techniques arising out of the revolution in logic around the turn of the 20th century. modus ponens: the form of inference a, a + c/c. name: grammatical category for a word that refers to an object (all being well). necessity: it must be the case that.. negation: it is not the case that. particular quantifier: something is such that. possibility: it may be the case that. which expresses whatever is said about what the sentence is about. premisses: the part of an inference that gives reasons. Principle of Indifference: given a number of possibilities, with no relevant difference between them, they all have the same probability. prior probability: the probability of some statement before any evidence is taken into account. probability: a number between o and I, measuring how likely something is. give a more complex sentence, is such that the truth value of the compound is completely determined by the truth value(s) of i t s component(s). truth table: a diagram depicting truth conditions. truth value: true ( T ) or false (F). universal quantifier: everything is such that. reason of some kind for the conclusion. it's not the case that. some object, x, i s such that. every object, x, is such that. .. it must be the case that. . . it may be the case that. . .
. not both ( . . . and not. . . ) it was the case that. . . it will be the case that. . .
it has always been the case that. it will always be the case that. . . .is the same object as . . .
. . .is less than . . . . . .is less than or equal t o . . .
the number which is the truth value of. the object, x, such that. i f . . .then..
. .and . . . Min the lesser of. . . and . . . the probability that. . . Pr pr( ... I .. ) the probability that. . . given that. . . the greater of. the expectation of its being the case that. the value of its being the case that. . . .is approximately equal to . . .
or neither? Why?lose is Spanish; most Spanish people are Catholics; so lose is Cotholic. Chapter 2 Symbolize the following inference, and evaluate its validity. Eitherlones is a knave or he is a fool; but he is certainly a knave; so he is not a fool. Chapter 3 Symbolize the following inference, and evaluate its validity. Someone either saw the shooting or heard it; so either someone saw the shooting or someone heard it. Chapter 4 Symbolize the following inference, and evaluate i t s validity. Everyone wanted to win the prize; so the person who won the race wanted to win the prize. Chapter 5 Symbolize the following inference, and evaluate i t s validity. It's impossible for pigs to fl' and it's impossible for pigs to breathe under water; so i t must be the case that pigs neither fly nor breathe under water. Chapter 7 Symbolize the following inference, and evaluate its validity. If you believe in God, then you go to church; but you go to church; so you believe in God. Chapter 8 Symbolize the following inference, and evaluate i t s validity. It has always rained, and it always will rain; so it's raining now. Chapter g Symbolize the following inference, and evaluate i t s validity. the same observable symptoms. go%of those who present with the symptoms have illness A; the other 10%have illness B. Suppose, also, that there is a pathology test to distinguish between A and B. The test gives the correct answer g times out of lo. Chapter 13 You hire a car. If you do not take out insurance, and you have an accident, it will cost you $1,500. If you take out insurance, and have an accident, it will cost you $300. The insurance costs $90, and you estimate that the probability of an accident is 0.05. Assuming that the only considerations are financial ones, should you take out the insurance? Philosophy (London: Macmillan, 1967). Heath, P. The Philosopher's Alice (New York, NY: St. Martin's Press, 1974). Hick, J. Arguments for the Otistence of Cod (London: Collier-Macmillan Ltd., 1964). Hodges, W. Logic (London: Penguin Books, 1977). Howson, C. and Urbach, P. Scientific Reasoning: the Bayesean Approach (La Salle, IL: Open Court, 1989). 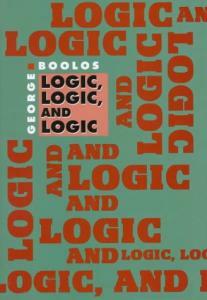 Read, S. Thinking obout Logic: an lntroduction to the Philosophy of Logic (Oxford: Oxford University Press, 1994). Sainsbury, R. M. Paradoxes (Cambridge: Cambridge University Press, 2nd edition, 1995). Sanford, D. H. /f P then Q: Conditionals and the Foundations of Reasoning (London: Routledge, 1989). Skyrms, B. Choice and Chance (Encino, CA: Dickenson Publishing Co., 1975). Strawson. 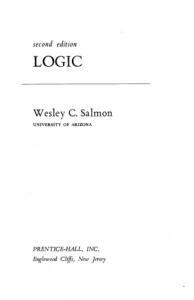 P. Introduction to Logicol Theory (London: Methuen & Co., 7952). Williamson, T. Vagueness (London: Routledge, 1994). 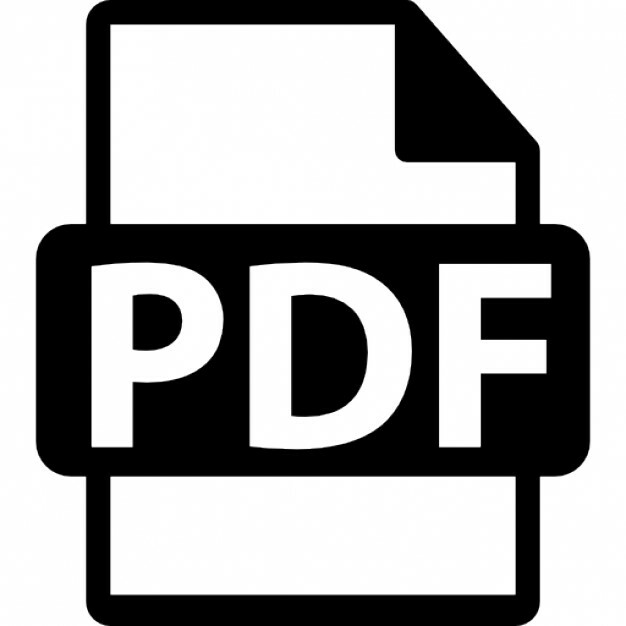 References are to pages unless preceded by 'ch. ', in which case they are to whole chapters. Principal references, in cases where there is more than one reference, are printed in bold. fatalism 39,45f Aristotle's argument for f.
Dali, S. 61 Descartes, R. 109 Diodorus Cronus 106 Dodgson C., see Carroll, L.